The most common questions asked by users of Complete Update URLs for WordPress. What is the purpose of the Complete Update URLs WordPress plugin? This plugin helps you relocate your WordPress install from one domain to another without having to change all of the URLs manually. What are some common reasons why I would want to use the Complete Update URLs WordPress plugin? If you develop websites on a test server (example: www.test.yourwebsite.com) and then want to launch the site live (example: www.yourwebsite.com). Where do I get Complete Update URLs? Get Complete Update URLs directly from WordPress.org or install from within your WordPress admin interface. How do I use Complete Update URLs? Visit the Complete Update URLs configuration section from WordPress admin. 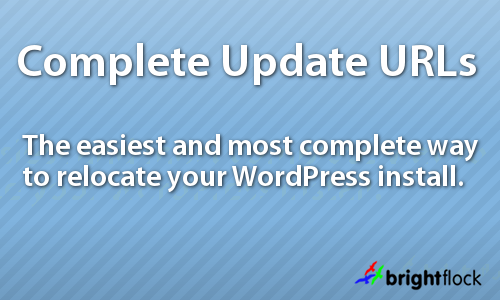 Type in the new location for your WordPress install and click update. Alternatively you can skip step #2 and step #3 and use the command line tool instead. How do I use the command line tool? Complete Update URLS completed successfully (205 database entries changed)! Who do I contact for support requests? Send an email to contact@brightflock.com for the quickest response.